To achieve a truly sustainable healthcare facility, facility managers must consider toxicity of materials and cleaning agents in interiors product selection. 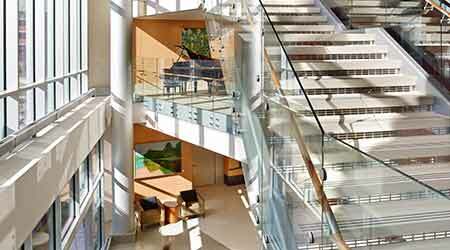 LED lighting offers multiple benefits for patients, staff, and the hospital’s bottom line. LEDs cut energy use, and the fixtures are more controllable. Moreover, the streamlined design of LED fixtures means less dust collecting on fixtures and less cleaning. LEDs can also be dimmed and tuned to change the color of the light. “The blue light that comes off monitors and screens is disruptive to people’s sleep patterns, and the amber-colored LED light used at night allows nurses to check vital signs without waking patients up,” Elias says. Copper and silver are two substances that can kill microbes — something the ancient Romans knew — so hospitals are now using silver nano-technology and copper alloys to coat hardware for bed rails, doorknobs, and light switches. Like other facilities, hospitals are retraining their staff to use less toxic cleaning methods as well. Vacuum toilet systems are also being installed in hospitals, which use dry pipes, vacuum pumps, and a small amount of water to pull waste through and don’t have to be gravity fed. This allows hospitals to “put toilets in spaces where you couldn’t put them before without tearing up concrete slabs,” Elias said. These toilets use over 60 percent less water than standard toilets, but some hospitals have been reluctant to install them because they are afraid plumbers will not know how to fix them. “All of this innovation requires continuous training and education,” Spadafore says. In some cases, sustainability and patient satisfaction come into conflict. New hospitals in the last 10 to 20 years are designed with standard private rooms, and renovations typically convert old rooms into private rooms. “Private rooms are tied to patient satisfaction but hurt sustainability,” explains Kelsie Whittington, senior designer for CallisonRTKL, because they require extra space, plumbing, electrical, and so forth. Other space-saving strategies can be used, however. A trend toward smaller, more efficient hospital lobbies has emerged, as an alternative to giant, oversized spaces, she says. These spaces perform better because they can be well-designed with a lot of natural light, beautiful interior finishes, art, and so forth, without being “three stories high and requiring intense heating and cooling all year round,” she says.